One metaphor for good experience design is the impeccable host. One who greets guests, anticipates their likes/dislikes, prepares a menu of intriguing items that will be devoured (or worst case, tolerated), introduces people, stokes conversation, curates some amusements, and then caps the evening off with a nice treat. This summer I had the privilege of creating a course from scratch, one that I dubbed Spacetime UX. I went a bit meta–I remembered this fictitious, Martha Stewart-esque host metaphor–and I knew that I would have to end the course with some type of a takeaway. A class souvenir! Since we often went analog in class, and invented and played a lot, this souvenir of course would have to hit the same notes. Then I remembered Storycubes. 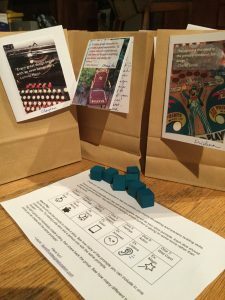 Though they are intended for children, I always thought there should be a UX design version–something that helps us boring, regimented adults exercise our improv, flash fiction and scenario building muscles. So building off this and in the spirit of rapid ideation, I whipped together a blank set for each student in my class. 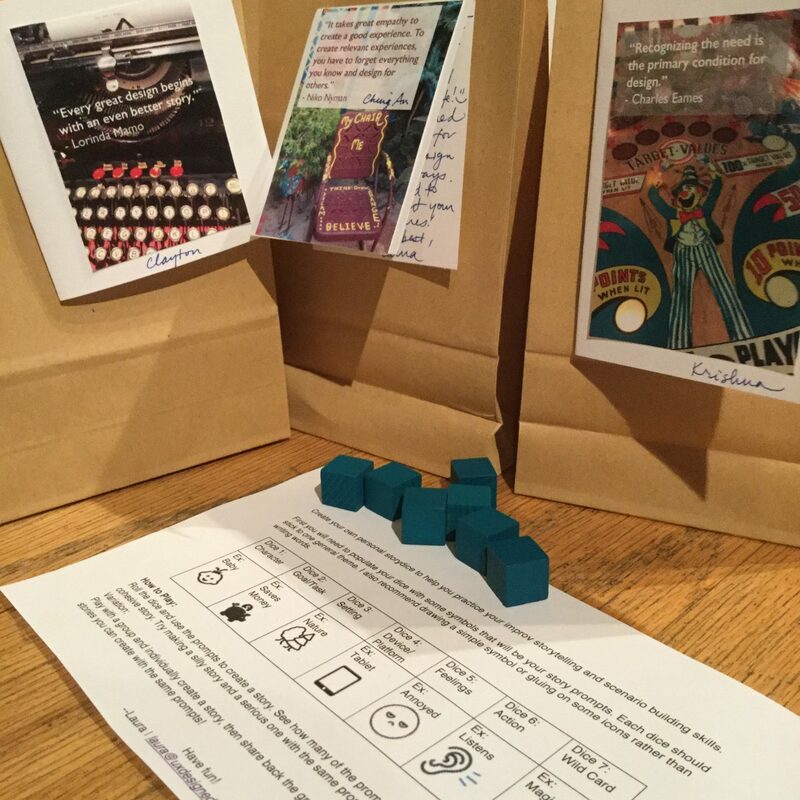 I dubbed these Storydice (not terribly creative, I know). Though if your work is in a more specific domain, or if you’re trying to solve a particular design problem, I imagine you could narrow your themes down. You could also include some icons that are more abstract/vague that are open for interpretation. And of course you’ll want to include a few silly ones to keep things fun. After each facet has an icon, you’re ready to roll (literally!) You simply take all of the dice and toss them. Each symbol may be used as a prompt to help create a story–basically it’s a story constraint. See how many prompts you can include and still tell a cohesive story. If you’re with a group, see how many different stories you can tell with the same prompts. Experiment with telling a silly story and a serious one with the same prompts. If you make interesting variations, or do something fun with your Storydice, please let me know!